From August 1 to August 8, 2018, enjoy half price July Munil Costume and Accessory Random Boxes! 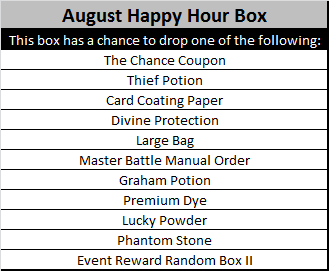 August Happy Hour Box is Here! waiting for 15-25sec just to pass loading screen. try to change your regional language to english - united states. already english but still crashes, trying reinstall ro2 , but it gives another problem, " cant connect patch server "
Edited by asukraxx, 08 August 2018 - 06:18 PM. Edited by MiniGuuMi, 08 August 2018 - 08:37 PM. anyway, i just guessing here did you ever use any edited UI or edited Data.vdk before? if so, it might the reason why you keep crashing when trying to log-in. i think the cause of the problem was apparently one or more of system font files being corrupted, or maybe accidently replaced some content on %SYSTEMROOT%\Fonts with the other contents. The font used by the ro2 client, MS Sans Serif, being substituted for a different one that isn't legible at point 10 or 12 (whichever the client uses). This could happen if the file that contains the font MS Sans Serif was corrupted or missing. - Change your Windows theme to the default one, "Windows 7". If you're already using the "Windows 7" theme, then change your theme to any other one, and then back to "Windows 7". - Restore Windows's default font settings. - Repair or restore any corrupted or missing system files (follow option 2). - Manually reinstall the MS Sans Serif font (follow option 2). Which language do you use to play ro2? Just in case, I don't suggest keeping that read-only md5filelist.txt since that will prevent the patcher from updating (which is a bad fix in the long term). It's also possible your "can't connect to server" error was due to it being a maintenance period. There was an issue with font files that should've been fixed recently. So clean installs of ro2 should work by now. Edited by asukraxx, 12 August 2018 - 08:05 PM. if you have other game id, try login it. if the other game id able to login so the only way to fix character issue on the crash char only from WP support team. maybe recent RO2 patch didn't support older graphic card anymore. Edited by asukraxx, 13 August 2018 - 08:35 PM.